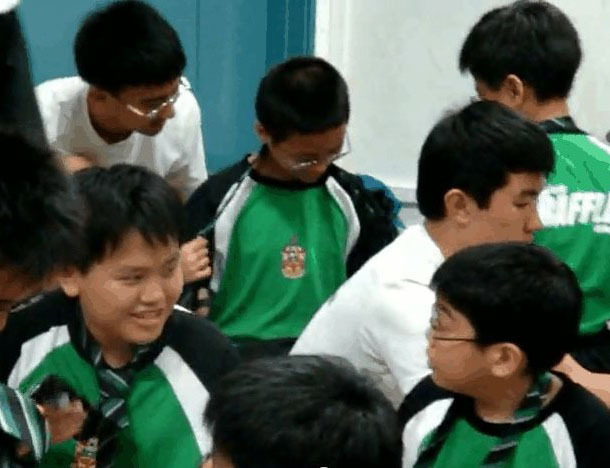 I remember the first time I met Brandon during an intra-school chess tournament when he was in Year 1. Although he finished second, he was shy and unassuming. Subsequently, Brandon joined the chess club, balancing his commitment with his involvement in the squash team. It didn’t take me long to realize Brandon’s exceptional talent for the game. The rate at which he improved was simply astounding. During the June holidays in 2010, Brandon took part in the Raffles Cup – the most prestigious chess competition in the nation. His team comprised of four lower secondary participants, putting them at a disadvantage against far more experienced players. In spite of this, Brandon was unfazed and capped a majestic display with 6 wins in 7 games, emerging as the best performer amongst the RI teams and rivaling his seniors. At this point it was already clear that his determination was extraordinary. Many of the games he won were fantastic comebacks, demonstrating his fortitude and composure. Even when he lost, Brandon stayed optimistic, putting up a good fight followed by a smile and a firm handshake. Playing alongside him was truly amazing, and we developed an unbreakable bond between us during this time. Unknown to him and to us, a tumor in his brain had already been growing for 6 months, leading to intermittent dizziness during the competition. He was diagnosed with cancer 2 weeks after the euphoria of Raffles Cup. At that time, I found it difficult to take in the information. I never fathomed this would happen to someone so close at such a young age. He was friendly, well-mannered, and got on well with everybody; I could not help but feel a sense of injustice on his behalf. He would fight his illness with the same resilience as he did in the Raffles Cup. I first visited him after his first string of chemotherapy sessions. He was much thinner, but was still in relatively good shape. Despite the circumstances, he exuded an air of positivity around him, chatting about depressing issues in a light-hearted manner and joking about when his chemotherapy sessions would be over. During this visit, he requested to join his teammates for another competition. With permission from his doctor and parents, he joined us for another tournament the following year. I could not imagine the enthusiasm and courage it must have taken for him to continue striving in the face of uncertainty. Brandon with his friends and well-wishers, during his final visit to RI in May 2012. It had been one of his last requests. 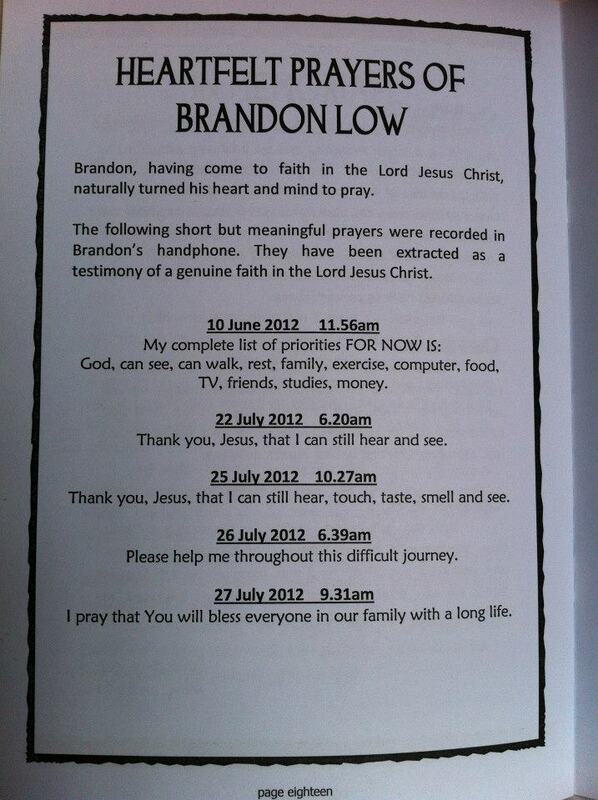 At the end of 2011, the school offered to promote Brandon to Year 4 even if he was unable to sit for his end-of-year examination. He declined the offer, continuing to revise his work even as he dealt with the side effects of treatment. Despite this, he achieved excellent results. I visited Brandon a few more times in hospital, and on each occasion his condition would have had deteriorated. But never once did his hopeful demeanor disappear. Each time he would greet us heartily and actively engage us in conversation. He would talk about how he looked forward to playing as a team with us again, and how he hoped to be able to obtain the elusive podium finish. Till now, his strength continues to amaze me. While we were fretting about Chemistry tutorials or Mathematics assignments, Brandon was continuously fighting and suffering the effects of chemotherapy and antibiotics – every single day. Yet, this did not stop him from looking forward to every new morning. He didn’t feel bitter about the fact that cancer had struck him, and kept looking ahead. Brandon exemplified greatness in every sense of the word. He was not just an inspiring Rafflesian or cancer patient – he was an extraordinary human being with an unwavering determination and a heart of gold. In the toughest of times, he put those around him at ease and carried on with “business as usual”. He showed us that every one of us has what it takes to surpass ourselves, and spurred us on to do even better. Despite being only 16 when he passed on, this was the profound legacy he left behind. The writer is chairperson of the RI Chinese Chess Club. Update: Watch Brandon’s class’ birthday video to him here (from January of this year). Yesterday, RI participated in the grand finals of the Straits Times - Ministry of Education National Current Affairs Quiz 2012 (also known, rather inventively, as the Big Quiz), triumphing over Anglo-Chinese Junior College, Hwa Chong Institution and River Valley High School to bring home the top prize of $5 000. But what of the ST's weekly free newspaper drive prior to the Quiz? Girls Making Boys Do Push-Ups? Yes, Sir! Eagle Eye preview: One's Uniformed Groups journey does not need to end at Year 4 — we find out about Rafflesians who have returned to serve their former CCAs. It’s a great piece, Ki Vin. I hope it will help others understand and learn a lot more about Brandon, just like it has helped me. Thank you. I’m a friend of Brandon too. We were both from the same CCA as well. He studied hard, graduating from RI completing all his exams. His final wish was to be donned in school uniform and tie when the time came. Those who went to his wake would’ve noticed. His expression of gratitude to the school, and friends from school who have helped him along this journey, has earned him every single ounce of respect from me.